Francisco J. Núñez, who was awarded a MacArthur Fellowship because of his decades-long work in achieving diversity among performers and audiences, has been invited by Arts in a Changing America and the Kennedy Center to speak at a Forum on cultural equity and diversity issues in the orchestral field. Mr. Núñez will also join take part in a round-table discussion on the shifts taking place among orchestras, what diversity and cultural equity look like, practices, and challenges. 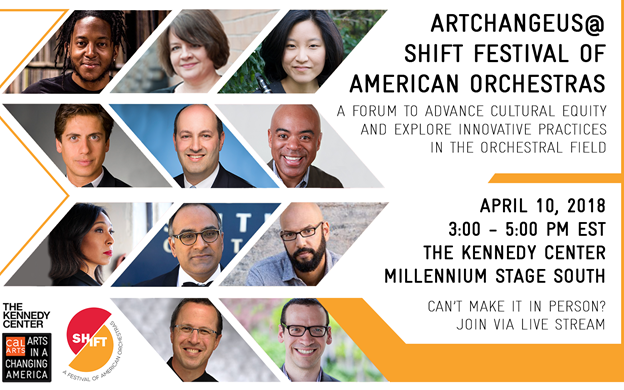 This forum is part of the "SHIFT: Festival of American Orchestras," bringing together an accomplished group of artist leaders to advance diversity and cultural equity issues in the orchestral and larger arts field. The forum will start with TED-style presentations by artists and cultural organizers who are boldly transforming the arts. This event will engage much-needed questions about the universal challenges facing orchestras as the audience landscape changes, communities call out for more engagement from their non-profits, and the art form seeks its place amidst the currents of contemporary American life. To attend this event, please RSVP here. The event will be live-streamed here for those who cannot attend. Most SHIFT events are free and open to the public, however the four concert performances by SHIFT orchestras are $25 each; a list of the events (and tickets) can be accessed HERE.